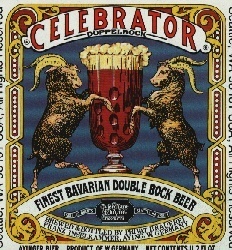 Noticeably lacking Ayinger tag, Celebrator’s at the threshold of distinct full-bodied Bavarian-styled brewing. Its beautiful jet-black frame, frothy whipped cream tan head, and sweet chocolate whiff offer up-front resilience maintained by lactose stout-like chewy caramel thickness. Sharp charred hop bite emboldens tobacco chew, pine, fig, and cola nut illusions as brown sugar, honeyed molasses, and toffee coat lofty Black Forest cake signature. Buttered pecan, toasted almond, burnt cedar, and hazelnut paint the corners, enchanting the earthy grain bottom to an emphatic espresso finish perfect for heavenly dessert.